Reminder, 10/5/18 is a student free day and parent/teacher conference week is 10/9-10/12 (1:05 early release schedule). MobyMax Learning Academy will begin before and after school on 10/17/18. This adaptive reading and math Common Core program is offered to support all students. New after school Literacy/Reading club here at Lake Marie! This year we will add a brand new reading club called "Bookworm Club" facilitated by our school librarian, Ms. Sarah Hernandez at Lake Marie! The purpose of this club is to give all 1st-6th grade students an opportunity to read daily and ensure our students meet their reading requirements for their grade level; and make their Accelerated Reader goal. This club will give support for our student's reading fluency, comprehension and will also help them meet their AR goal. It gives them silent reading time as well as different activities they can participate in to help them get excited about reading! They are also allowed to take quizzes during this time. If you would like your child to attend, please sign the permission slip and return to your child's teacher. More details to be sent home on the first few weeks of school. 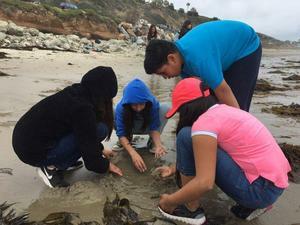 Lake Marie 6th grade students in Malibu at outdoor science school. Here are a few pictures of our student having an amazing time and conducting scientific inquiry in chaparral and also on the beach. What an amazing experience for all of them. I would like to take this opportunity to praise our Lake Marie 3rd-6th grade students, families, K-6th teachers; and school staff on the significant academic gains in English Language Arts and continued growth in mathematics. This is a group effort and we value all stakeholders. We are off to a strong start for the 2018-2019 school year! Your student CAASPP scores will be sent home in the first few weeks of school. During our September "Coffee with the Principal" I will review Lake Marie CAASPP school data and how to read your child's CAASPP letter. Refer to the September school calendar for important dates. MobyMax Learning and the Technology Academy will begin in October where students will be given supports to strengthen and extend their reading and mathematical skills. We are continuing the implementation of our OLWEUS program and integrate PBIS. We will try and help students who are bullied. If we know someone is being bullied, we will tell an adult at school and at home. All K-6 teachers implement strong first instruction utilizing Common Core State Standards (CCSS) and best practices in an effort to challenge our students, foster the development of critical thinkers, creative problem solvers; and to be competitive 21st century learners. The teachers have undergone extensive training in English-Language Arts and mathematics. As a school community we believe our students will benefit greatly from deeper levels of thinking, inquiry based learning, and being engaged in the classroom. Please feel free to visit Ms. Palomino in the front office if you have any questions about the Common Core State Standards.